Yesterday, I mentioned some very interesting research that AuctionBytes recently completed with a survey of more than 1,000 eBay merchants. The most interesting finding is that eBay sellers are leaving eBay’s platform very quickly. The chart below details where merchants are currently selling their product, and where they plan to sell product 6 months from now. 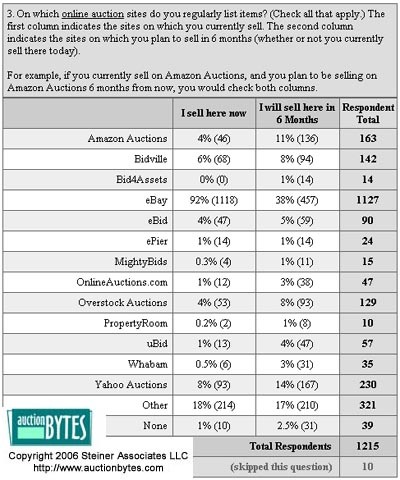 There is a massive 64% decrease in the number of sellers planning to sell on eBay 6 months from now versus today. as well, but this trend is becoming undeniable. currently being taught at The Wharton School, University of Pennsylvania. I believe you will find it to be a fascinating and insightful read on the eBay challenges. How Do You Sell Profitably on eBay? I think it is more than that. I think that because e bay has increased its fees so much and changed many policies in favor of bigger ebay sellers and businesses while adding more fees that they are opening up the door for competing market places. They are sealing their own fate, even if it is slowly.